Brewing simplicity is what you'll get with press pot brewing. Ground coffee, hot water, and 4 minutes brew time are all you need to enjoy your favorite roast. 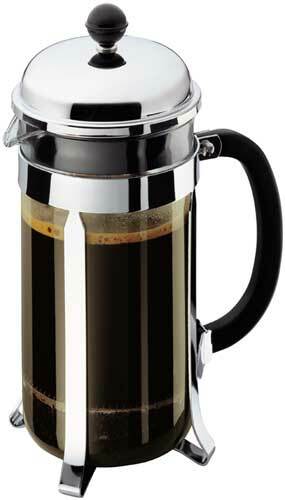 This pot size is fit to brew 2 large 12 oz travel mugs, or four 6 oz cups after dinner at home. Frame and lid are chrome plated steel, and will withstand years of use. Polypropylene handle, glass chamber.